CSG Spec offers a line of sprint & endurance friction materials that offer peak brake performance, pedal stability, braking control, high fade resistance and low wear compared to competitor offerings in the market. Through extensive development on multiple motorsport applications (GT Racing, Time Attack, HPDE, One make races, etc. ), CSG Spec brake pads have been further developed to meet the specific demands of customers for whom "off the shelf" products had often proved inadequate. 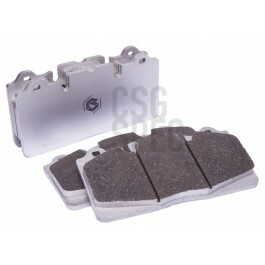 Friction materials (brake pads) are easily one of the most critical and trivialized component of a brake system. However, the constant evolution of overall car performance, increased use of in-car data acquisition and analysis systems, improved tire technology and chassis grip (aero, suspension upgrades, etc.) 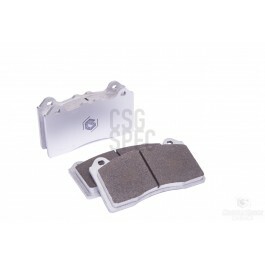 has greatly increased the overall demand on the OE or Performance braking systems. The development of racing friction materials has now evolved as well to meet the growing technical demands of gentleman and professional racers in markets worldwide. Over the years, CounterSpace Garage has placed a high emphasis on the overall testing of various friction materials with different applications since overall brake performance is a key development point for quicker lap times and car performance. 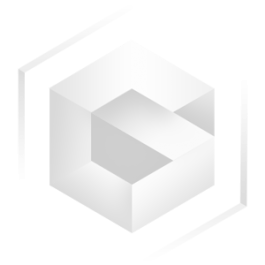 The collection of data has allowed CounterSpace Garage to give relevant developmental feedback to suppliers to develop more specialized friction materials. 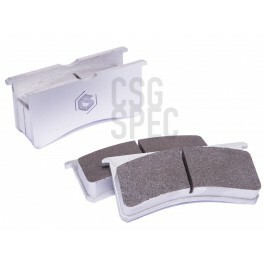 These newer and more advanced friction materials are now supplied as "CSG SPEC" brake pads in various HPDE, Club and professional racing markets. With extensive development on multiple motorsport applications (Examples: GT Racing, Time Attack, HPDE, One make races, etc. 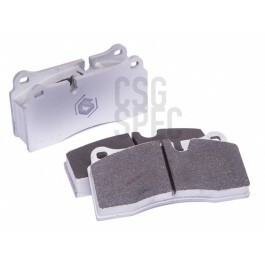 ), CSG Spec brake pads have been further developed to meet the specific demands of customers where "off the shelf" products were often inadequate. To ensure that CSG Spec products offered the most consistent performance for each application, a combination of lab and field testing was done to simulate the conditions seen in the real world.  The result is a line of sprint & endurance friction materials which offer peak brake performance, pedal stability, braking control, high fade resistance and low wear compared to competitor offerings in the market. CSG Spec Sprint friction materials for sprint races provide excellent overall braking performance and initial response (or "bite") while maintaining pedal stroke stability, smooth brake release and fade resistance lap after lap. 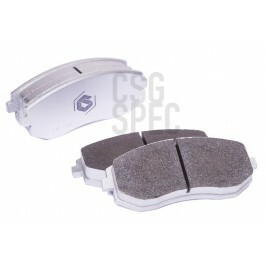 CSG Spec Sprint brake pads are compatible with a wide range of tires (from sport tires to racing slicks), as well as OE or Motorsports ABS and Traction Control systems. 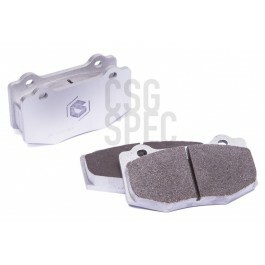 CSG Spec friction materials supplied for sprint races are developed to provide excellent overall braking performance (initial response or "bite") while maintaining pedal stroke stability, smooth brake release and fade resistance lap after lap. Since sprint race distances are generally on the shorter side (1-4 hour races), the main emphasis is fade resistance with reasonable pad and disc wear rates. Key development points also include ensuring that these friction materials are compatible with a wide range of tires (sport tires to racing slicks) and ABS or Traction Control ("TC") systems found on OE and motorsport applications. A complete range of medium to higher friction materials ensures that the exact compounds can be selected depending on the specific customer, tire ranges, driver skill and platform balance needs. Sprint compound with a progressive, high friction profile for high grip tires. Very strong bite and moderate wear. Sprint compound with a progressive, medium-high friction profile suitable for a wide range of grip levels. Strong bite and moderate wear. Sprint compound with a linear, medium friction profile suitable for high grip tires. 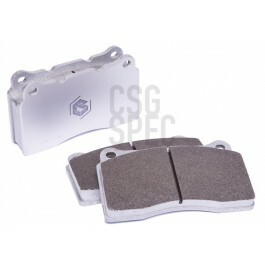 Designed for rear axle applications only. 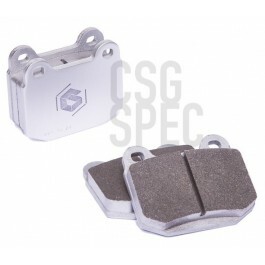 CSG Spec Endurance friction materials are developed to meet the wear resistance needs of customers that participate in longer race distances (10-25 hour races) or would like to get maximum life out of their brake pads. Specifically chosen raw materials allow for lower compressibility, less heat generation into the brake system and maximum disc life. 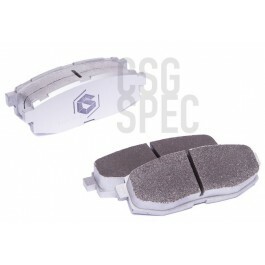 CSG Spec Endurance materials are commonly used for sprint races as well due to their versatile nature and higher stopping power when compared to products from other competitors. These specific friction materials have low wear rates so that race teams do not have to perform unnecessary pad changes (which can cost them a race win). The result is also a better long term value due to lesser operating costs and number of pad sets purchased to finish a race or season. Endurance type friction materials generally operate in a wider temperature range and are kinder to the brake system as well. Raw materials are chosen specifically to offer lower compressibility, generate less heat into the brake system (calipers, seals, brake fluid), and offer maximum disc life. 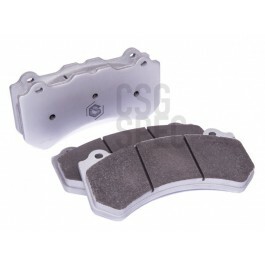 This is beneficial especially on OE brake systems where the pad thicknesses are generally very low (13-18 mm pads) and the brake discs do not have thermal capacity. Depending on the application and intended use, CSG Spec Endurance materials are commonly used for sprint races as well due to their versatile nature and higher stopping power (compared to competitor brands) which gives drivers maximum braking confidence. Endurance compound with a progressive, low-medium friction profile suitable for a wide range of grip levels. Medium bite and extremely low wear.  Endurance compound with a digressive, low friction profile designed for rear axles. Low bite and low wear.